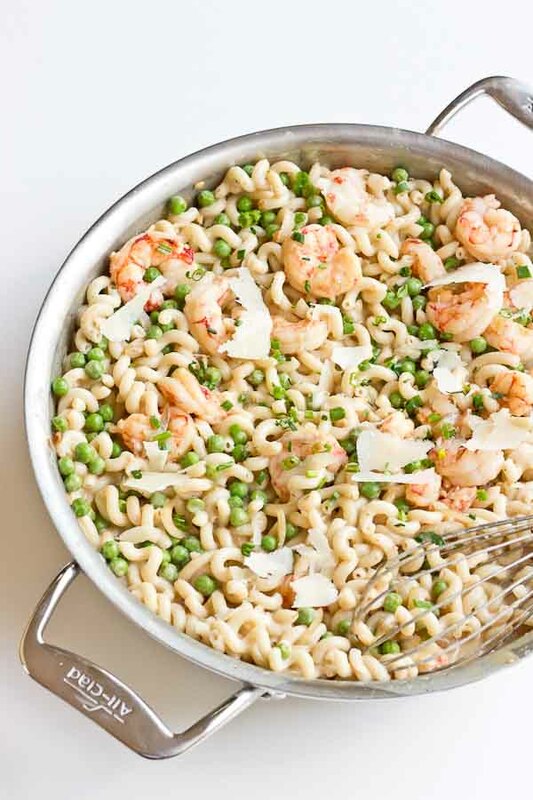 Your favorite food as a kid just grew up… peas, shallots, wild red shrimp, gruyere and cheddar cheese. 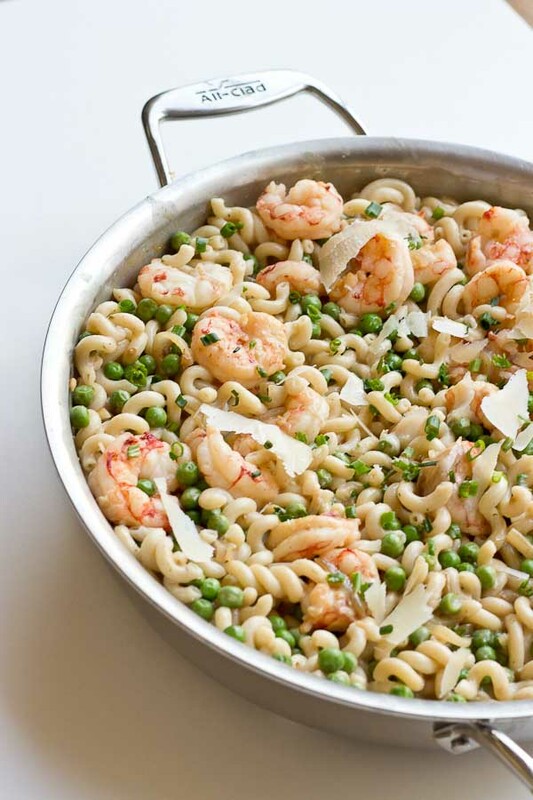 Get a bowl of this Shrimp Mac n Cheese ASAP! Happy hump day friends. It’s mid July… but I really can’t believe the summer is almost over. So much so that I’ve started to see some pumpkin recipes floating around the web. I know, I know, for you summer purists, how dare I say the word pumpkin in July. But first we are headed to the beach this weekend for a big family friendly weekend with all the LaRues. 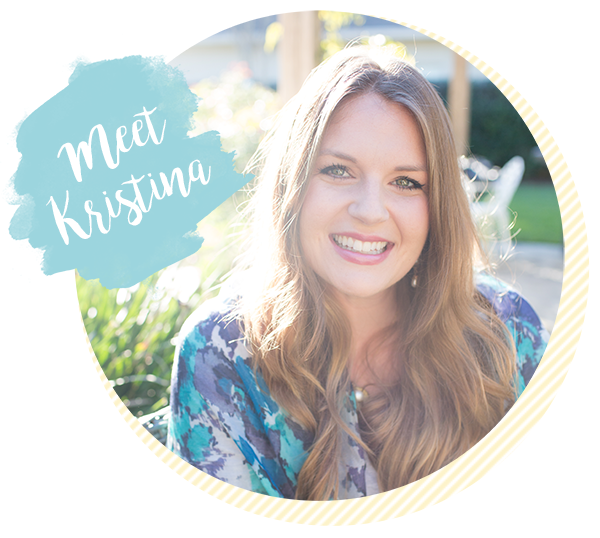 I’m looking forward to a little getaway and spending the weekend relaxing with the fam, and all of the new babies. Last year at the beach 3 of us were preggers and this year we have babies ranging 7-13 months + a 4 year old. This year is going to be so different and probably less relaxing. With 3 babies with different sleep schedules all under one roof… AHHH. 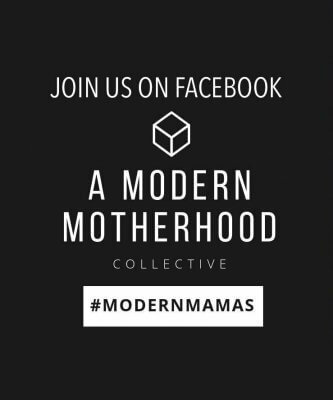 Anyone have any tips for traveling with a 9 month old? It’s only a two hour drive but I want to made the house as comfy as possible. We really haven’t traveled much with him, since he was a baby baby. So yeah, this should be fun! Time to start packing. In large pot of salted water, cook pasta according to package directions. Rinse and drain pasta and set aside. Meanwhile, heat olive oil over medium heat in large skillet. Add shallots and cook until begins to brown slightly. 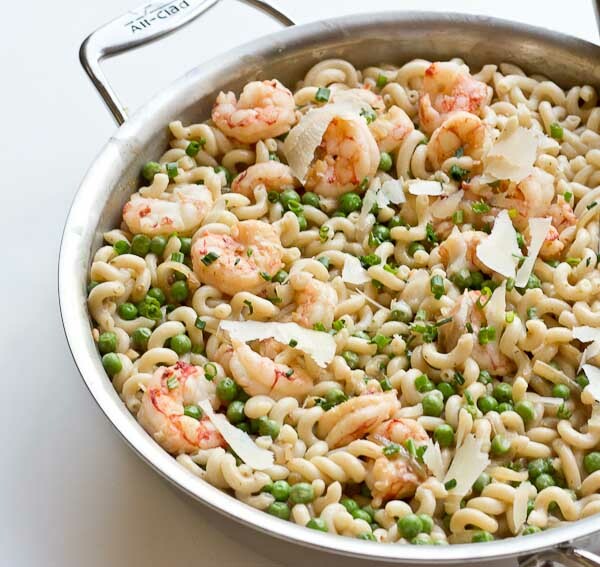 Stir in shrimp and fresh peas and cook until shrimp are cooked and heated through. 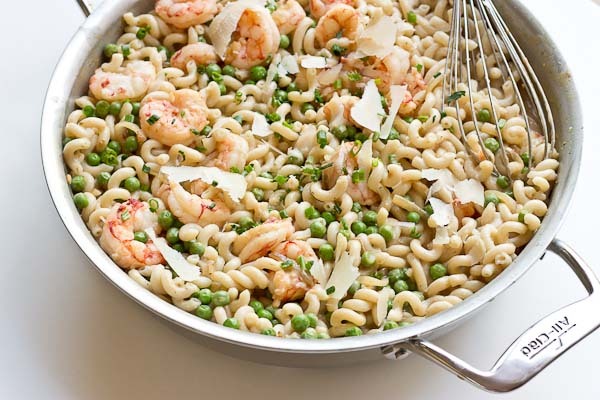 Remove shrimp and peas from pan and set aside. In same pan, melt butter and whisk in flour to make thick paste. 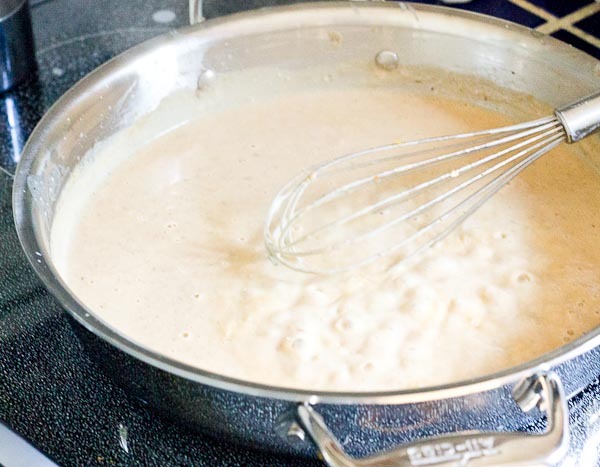 Whisk in milk slowly to incorporate flour and butter and form sauce. Bring milk to a boil and allow to simmer a few minutes to thicken. Stir in cheese and continue to cook until sauce is slightly thickened. Season with salt and pepper to taste. 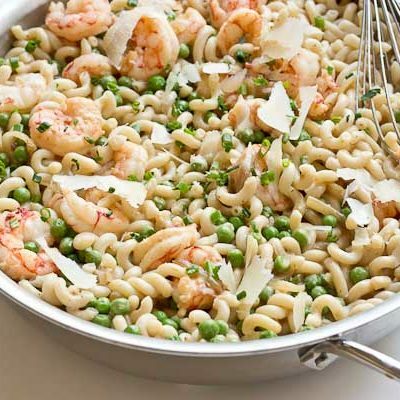 Pour pasta, shrimp and peas into the cheese sauce and toss to coat. Serve immediately with shredded parmesan cheese and freshly ground pepper. YES I LOVE mac and cheese! 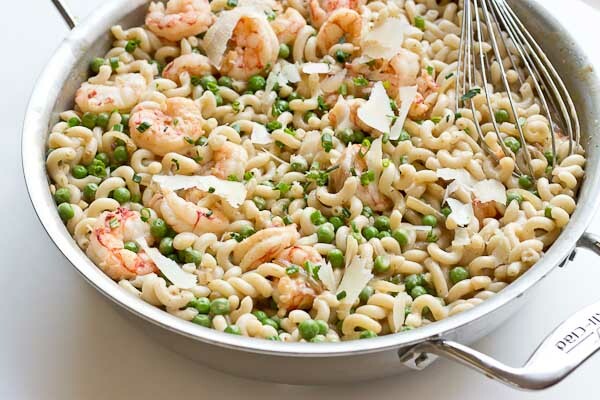 I’m obsessed that you added shrimp in the mix! 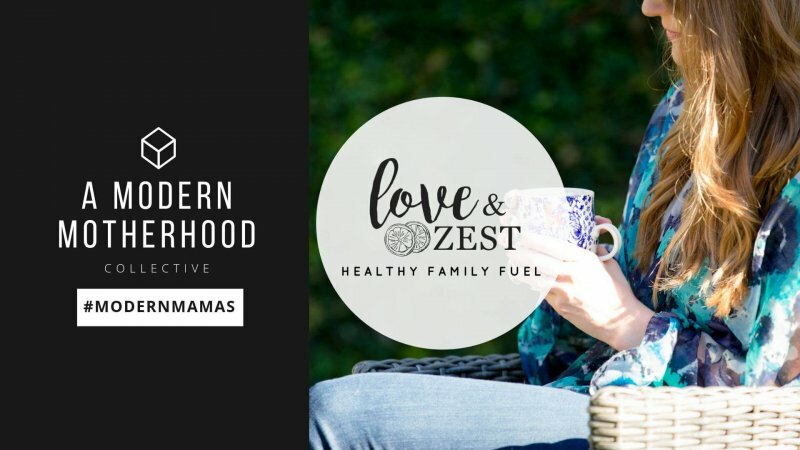 It’s like a grown-up version of the childhood classic!